I think this one month break is the longest I’ve been away from this blog. Short story is that I’ve been dealing with an issue that’s just been taking up so much of my time and energy, that I’ve been unable to do the stuff I love the way I know how. There’s not much more to share right now so until then … let’s set the issue aside and go to the “new stuff” and maybe an update on an old one. I’ve been plugging away on my Duotone cowl and really should be saying that it’s done, but even that happy spring project got set aside these past few weeks. I’m almost done with the second section; that’s not bad progress all things considering. With the Harry Potter Knit and Crochet House Cup back in full swing, I’m giving myself until the end of the month to finish it, kitchener it together then block and have the F.O. for you. I think all die hard crafters feel this way — when we go some time without doing what we love, we get more crazed! Am I right or am I right? So this weekend, I decided to jump back into the saddle and have some “soul food”. 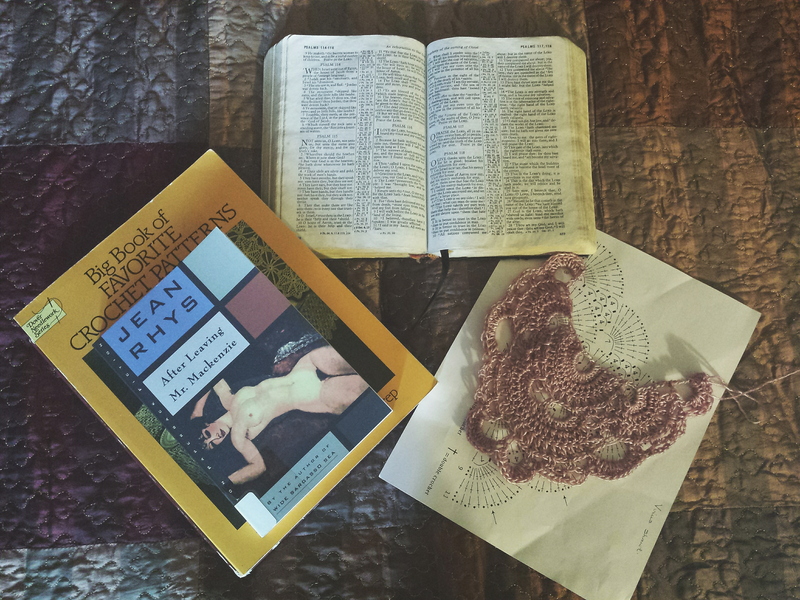 My Sunday intake of “soul food” meant reading my Bible, classic literature (that Jean Rhys woman I love to hate), vintage crochet books and starting a shawl pattern that my IG buddies Kokomire and Elisa were convinced I could do. I didn’t believe them but I tried anyway … and as my uncle would say … holy mackerel! I actually was able to follow the video then work solely from the crochet chart as there are no written instructions. Can I just brag here a little and say that I’ve never used charts only for knitting or crochet? Since Sunday, I’ve been doing what I need to during the day and counting down the hours before I can get to this project. The rows are already getting long but I’m going to finish it! I have to. Even my mom is waiting for the F.O. photos! So that’s what I did … or at least am trying to do. 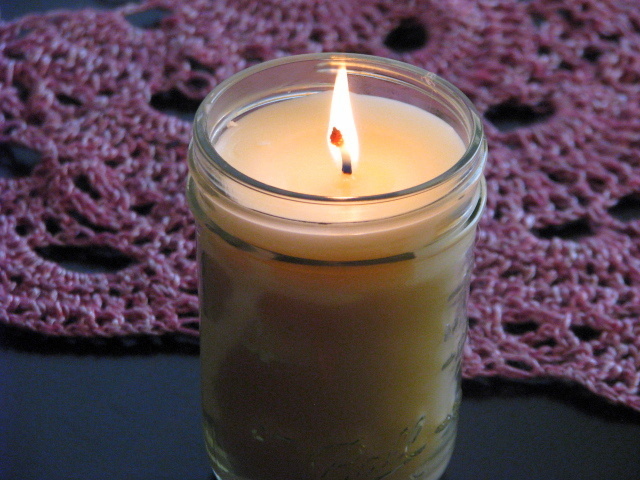 On Saturday, I added candle making to my repertoire. Not just melt and pour wax stuff. LOLOL! Actually working out ratios, measuring, melting, adding fragrance, then letting the mixture set so I could end up with a usable candle. As the sun went down yesterday, it felt good to walk through the apt and smell the fragrance of a candle burning that I made. I think I’m definitely out of my craft slump. How have you been since I’ve been gone? Yay for blog updates! That shawl is sooo beautiful wow!!!!!! Love the color too and so glad you are crafting all things. I love the way you honor yourself and nurture yourself!! May I add soapmaking to the list you should try or making body butters!!! I need to get back to that myself!! You’re another one of my enabler’s extraordinaire Amina! 😀 Thank you for your gracious words. I’ll be adding soap-making to my resume before the summer’s out. I actually have melt & pour solutions and lots of soap molds but I haven’t tried it yet. I really want to make it from scratch though. Will post as soon as I do! That crochet shawl looks lovely. Can’t wait to see it when it’s done. Haven’t been able to consistently knit in a while. Been getting it in a few rows at a time here & there, but no real progress so far. I really need a vacation so I can spend some time focused on nothing but that. I detest when ‘life’ gets I my creative way, it really does make my crazy. And your crochet? Stunning, stunning, stunning. Now I want to learn crochet! I know what you mean about taking breaks and then wanting to be fully back in the crafty mode! I love that crochet… yay for charts!! And yes, Andi is right about getting those candles out for sale!! that shawl is stunning! i think charts feel much more natural than written instructions once you get used to them… you will be so glad you took the plunge. hooray for slump-busting! The plunge with this chart has made me so open to knitting charts now. It’s so easy to glance and work. For the last two nights, I’ve been able to watch TV and work on this shawl. Win, Win!!! OMG! 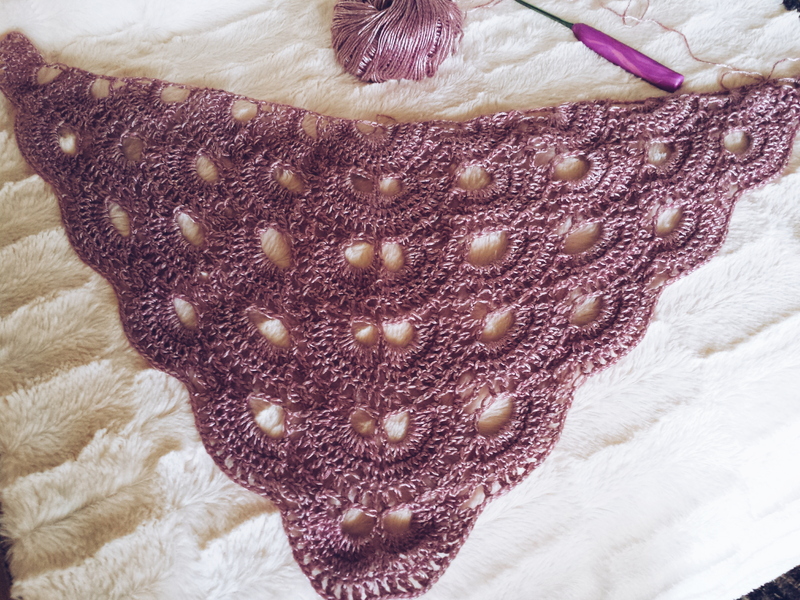 I just love everything about that shawl! Color, pattern, everything!! The candle scent I used was called Sunkissed Leaves. It’s light and very springlike. Yay for coming out of the crafting slump. I know what you mean about wanting to craft all of the things. I am doing my best to make sure I don’t get overwhelmed. What scent is the candle? You’re a better woman than me Ash. I’m just going to accept that there are a ton of crafts which interest me and I give myself permission to be diverted on occasion. LOLOL! Happy to hear that you got your craft groove back. Boy, did you get it back as that shawl is a stunner, love. Great choice in reads. I can see where they would have provided you with some much needed soul food. Thanks so much friend! I’m enjoying it immensely. It’s such a pleasure to be back doing the things I love.